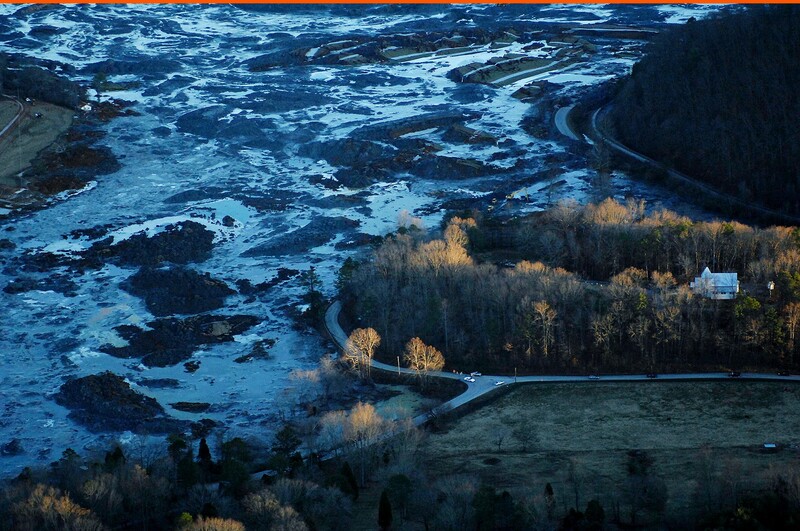 Duke Energy was just fined $25 million for a huge coal ash leak in North Carolina. So why are the victims of the Kingston, Tennessee spill— the largest industrial accident in American history — still waiting for justice? When Sarah McCoin woke that morning, she wondered what had happened in the middle of the night. Some commotion near the farm had disturbed her in the early hours — the sounds of emergency vehicles and helicopters — but there’d been no indication of what had brought them out. Was it a major crime? That seemed unlikely: After all, Kingston, Tennessee was a pretty sleepy town, with just under 6,000 residents. As she got dressed, McCoin turned on the radio to hear reports of a mudslide. But where could that much mud come from? “The only thing I could think of was someone had cleared a hill to put in a modular home,” she recalls. McCoin, who is 58 with short, sandy hair and stylish, thin-framed glasses, got into her car to commute to nearby Knoxville, where she worked as a benefits consultant. But less than a mile from her door, she hit a police barricade. She asked the officer on the road what happened; he just told her to turn around. McCoin, the ninth generation to live on her farm, wasn’t afraid of a little mudslide. “I’m in a four-wheel-drive — how much mud can there be?” she wondered. But the officer wasn’t friendly or forthcoming, and told her simply that she couldn’t pass. She shrugged. He had probably been up all night. It was only after driving about three miles in the other direction that she finally saw it: an epic wall of ash had settled like lava over the river, threatening Kingston. The muddy, toxic mass had turned the Emory and Clinch rivers, which wind around the city through the rolling Appalachian hills, into a sea of slime. The vision was horrifying. Mounds of sludge — “ashbergs” — forty or fifty feet high jutted out of the river, some topped with bushes and trees torn from their roots. What she was seeing was a disaster: the worst industrial accident in American history. Electricity changed everything in Kingston. One hundred years ago, it was a sparsely populated backwater in one of America’s poorest regions. But when the Tennessee Valley Authority — an energy company established by the federal government as part of a program to modernize Appalachia — brought power to the region, the town found a new identity. In 1951 the TVA started building a major coal plant in Kingston. Its thousand-foot smokestacks loom overhead, a symbol of jobs and income for locals. But while many residents work for the plant, it is the river that provides the lifeblood of the town. Up until the disaster, the shoreline was lined with docks, and in the summertime jet skis and kayaks filled the water. Many were ridden by youngsters visiting their grandparents: Kingston’s homes are, like waterfront property everywhere, places for people wanting to spend their golden years in a quiet, comfortable community. The TVA plant also needed to be on the riverside: access to water was necessary for driving its turbines. So its designers built the facility on the banks of the Emory, and, right next to it, they added a small retaining pond to hold the plant’s waste. In a typical coal-fired power plant, coal is burned, the heat generates steam, and the steam drives the turbine to the electrical generator. 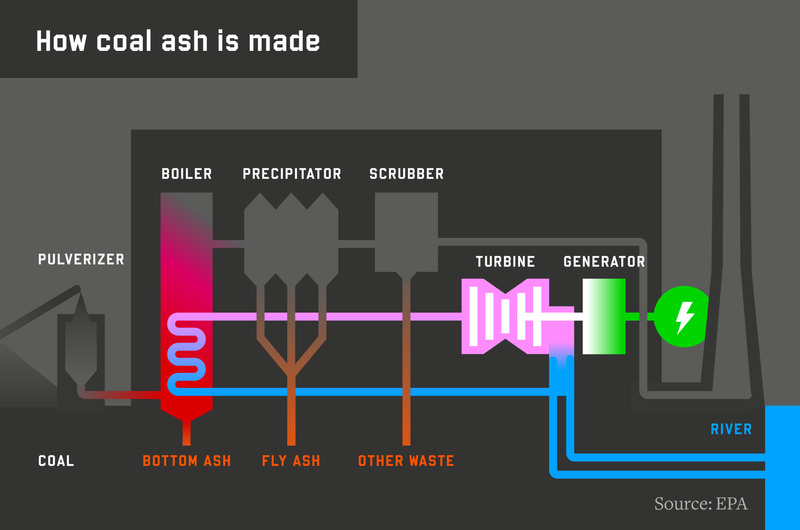 The byproduct is coal ash, made of fly ash that is carried up and trapped in stack filters, and bottom ash, which settles to the base of the boiler. The most toxic byproduct of coal-fired power isn’t carbon dioxide. It’s the residue that’s left over. When coal is burned in a plant, just like in a home, it produces two kinds of ash: fly ash, which rises, and bottom ash, which sinks to the floor of the furnace. Together, they comprise coal ash. In a power plant, all that ash has to be put somewhere. For many years Kingston was the largest coal plant in the United States, which meant the facility produced a lot of coal ash. It was mixed with water to stop it from blowing around and dumped into the retaining pond, which quickly swelled with the waste. As the region grew, demand for electricity soared, more coal was burned, and the TVA built the walls of the pond higher and higher. 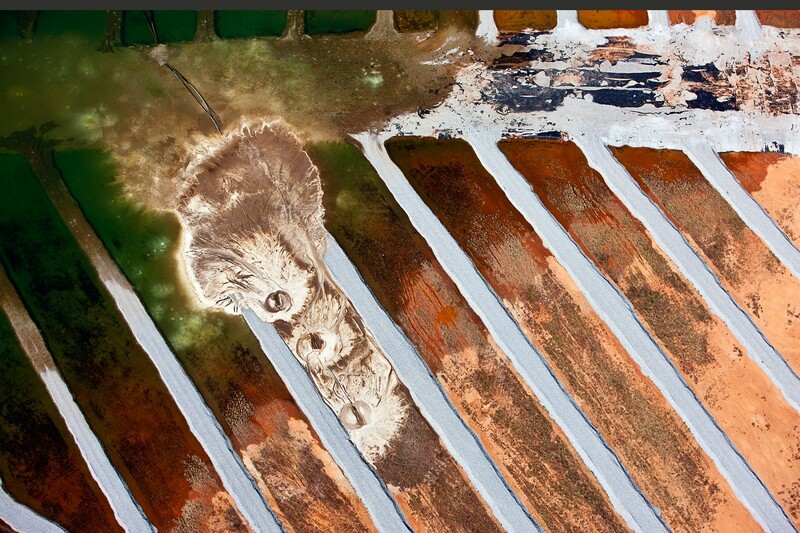 By 2008, they stood 60 feet tall, and the pond held more than a billion gallons of coal ash slurry. Shortly before 1 A.M. on December 22, 2008, the walls broke. One corner of the dike, exhausted after a half-century of pressure and decay, collapsed. The coal ash sludge poured out, tearing a hole that kept on growing. Once outside, the slurry built up force and barreled over a sequence of outer dikes. With no barriers left, the sludge made its way 200 feet down to the banks of the Emory. It was so strong and dense that when it hit the water, it forced the river to change its path, pushing it eastward. The water, glistening just hours before, became a thick, gray soup rich in carcinogens and heavy metals. For about an hour, while the town of Kingston slept, the slime spilled further and further from its retaining pond. The earth shook. The spill became a conveyer belt that slowly moved through the surrounding forest, ripping trees from their roots and driving them along its path. A cell-phone tower was thrown to one side. A railroad line was buried. The sludge picked up a bulldozer and swept it nearly a thousand feet. In fact, there was so much ash that it pushed upstream as well as down, moving along the Emory and into the nearby Clinch River. Nearby properties came into its range, and it began climbing up into the backyards and patios of houses along the Clinch’s banks. Three houses were destroyed, and another 42 properties damaged. No one was hurt, but Kingston residents said that was a stroke of pure luck. “Just about any other time, other than the very middle of the night of the longest night of the year — this was the winter solstice — we’d have had a body count,” says local resident Steve Scarborough. The TVA didn’t learn about the disaster until emergency radios started carrying the message of a 911 caller. A 45-year-old firefighter had been woken by the noise, gone outside to figure out the cause, and called in a problem — but what was it? A landslide? He couldn’t tell. Then he saw that a nearby house had moved across the street; his neighbor had had to break the bedroom window and climb out to escape his house as the sludge destroyed it. A TVA employee heard over the scanner that there was a problem at Kingston, and called the foreman of the plant’s ash storage system. Not long after, TVA police called Tom Kilgore, the company’s CEO, and roused him from bed. Coal remains the dominant source of electrical power in America, responsible for just under 40 percent of the nation’s supply. The TVA is the largest public power provider in the country, serving nine million people across seven states. Like many other power companies, it has slowly been expanding its energy portfolio, but coal remains its backbone. And, like the rest, it has been upgrading that infrastructure, forced by the Environmental Protection Agency to make its plants run cleaner and more efficiently. Usually, that means installing scrubber systems in the smokestacks, which clean the emissions of pollutants like mercury, toxic metals, and acid-rain-causing sulfur dioxide. 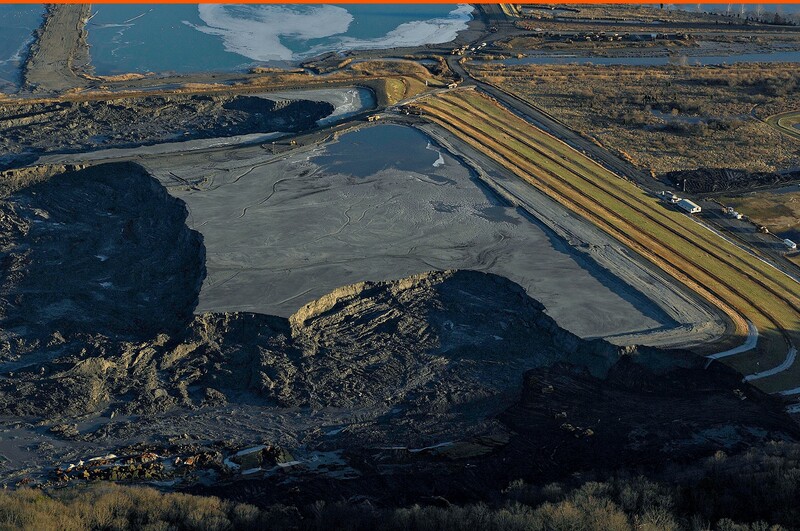 According to the American Coal Ash Association, the nation churns out nearly 65 million tons of coal ash annually. However, despite the fact that it is replete with toxins, coal ash is essentially unregulated by the federal government, with oversight meant to happen at state level. Yet most states handle the material with less precaution than your standard household garbage. The “best” use for coal ash, say scientists, is to recycle it and use it in cement, which means the contaminants get locked in and cannot leach out. But there are a range of other recycling methods, including using it in asphalt and wallboard, spreading it as a soil amendment, or using it as a substitute for salt on icy roads. One particularly novel method of disposal is dumping it into abandoned mines. Most coal ash, though, is simply carted off to landfills or placed in retaining ponds like the one at Kingston. Many of the ponds, including Kingston’s failed one, are not just built to contain the coal ash, but actually use it as a construction material in their dams and dikes. In Kingston, it was the dike that broke, but spills and contamination can happen in all kinds of ways. In 2005, a log wall broke in a basin at a Pennsylvania power plant, spilling at least 100 million gallons of coal ash into the Oughoughton Creek and Delaware River. 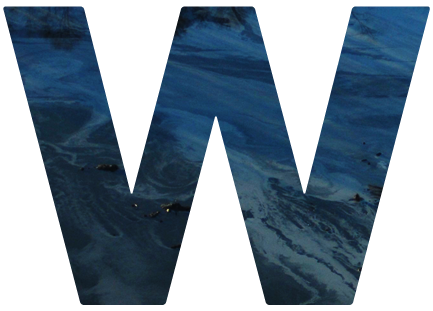 In October 2011, a bluff at a Wisconsin power plant collapsed, spilling coal ash into Lake Michigan. Environmental groups dislike pond storage, arguing that wet ash is more likely to leach contaminants into nearby water supplies, as well as being a far greater risk for catastrophic spills. A draft EPA risk assessment released in 2010 showed that coal ash ponds pose greater risk to human health due to leaching than landfills. Charles Norris of Geo-Hydro Inc, a scientist from Denver who has testified before Congress on the subject of coal ash, says things are made even worse by using it as a construction material. Not only does this let even more contaminants leach out, but over time it compromises the structural integrity of the pond. Kingston, Norris believes, is unlikely to be the last incident of its kind. “The use of this as a construction material is new enough that we’re probably just looking at the beginning few failures,” he says. n the Sunday evening after the spill, the TVA held a community meeting at the Roane County High School gym. Residents were concerned by the repercussions on the environment and their health, and were clamoring for an extensive cleanup. Steve Scarborough, a retired engineer who has lived in town since 1988, was distraught. “My beautiful clearwater view, the waterfowl — ducks and geese and herons and all that — went from one day being picture-perfect to the next day being a disaster,” he says. Within days of the spill, massive yellow construction and dredging equipment gathered in Kingston. It was a multi-pronged attack. Out in the river, hydraulic dredges dug ash from underwater and pumped it through pipelines that carried it thousands of feet to temporary storage areas. Near to shore, amphibious track hoes dug more ash and poured it into dump trucks waiting on ash-smothered makeshift roads. On land, excavation equipment loaded the ash into temporary storage piles. The spill was so big, though, that it was like trying to empty an ocean with a teaspoon. And while Kilgore vowed to fully clean up the spill, the TVA made it hard to measure progress. Residents who tried to visit the spill site, or to paddle or boat down the river to get a closer view, were stopped by local police or TVA security. The corporation also failed to address another significant question: What was the composition of the spill? The Environmental Integrity Project, a Washington D.C. nonprofit, decided to dig through the complex data to find the answer. It estimated that 140,000 pounds of arsenic had spilled into the Emory River, as well as huge quantities of mercury, aluminum and selenium. In fact, the single spill in Kingston released more chromium, lead, manganese, and nickel into the environment than the entire U.S. power industry spilled in 2007. The dangers of all those chemicals are well known. Arsenic is associated with bladder and liver cancer. 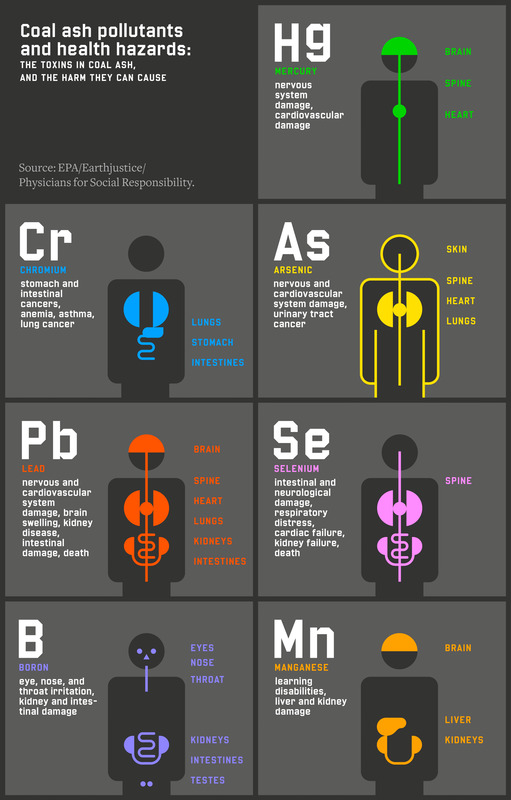 Lead causes damage to the brain, kidneys, nervous system and red blood cells. Mercury causes brain and kidney damage. Aluminum can compromise lung function. Hexavalent chromium is the “Erin Brockovich chemical,” and is known to cause cancer and damage to the respiratory system, kidneys, and other organs. Dennis Lemly, a U.S. Forest Service researcher, has been studying selenium in coal ash for decades, and warning public agencies about the dangers of coal ash pollution the entire time. In the 1970s, he studied Belews Lake in North Carolina. 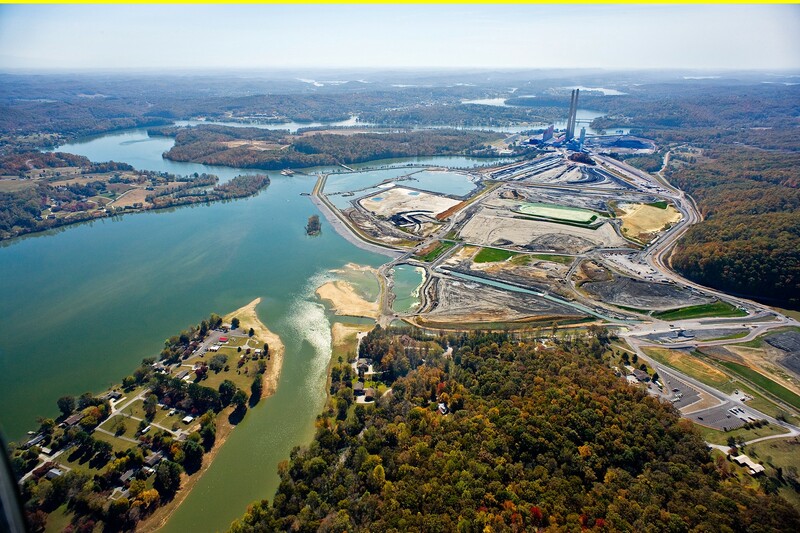 The lake became so contaminated with selenium from coal ash that ultimately all but one species of fish was wiped out. Lemly has photos of fish from that period with spines curved so badly they looked like slithering snakes; fish with deformed mouths, which limited their chances of survival because they couldn’t eat very efficiently; and “popeye” fish with bulging, cartoon-like eyes. Belews Lake was supposed to be a worst-case scenario. 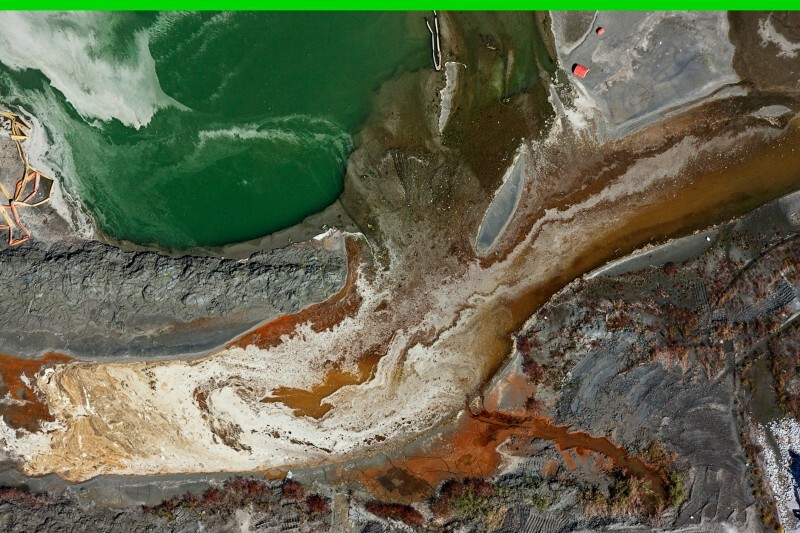 Yet Lemly recently released a new report documenting many of the same deformities in another North Carolina lake that receives coal ash waste from a nearby power plant. “The truth is, there’s a lot of [coal ash–damaged ecosystems] out there,” he says. 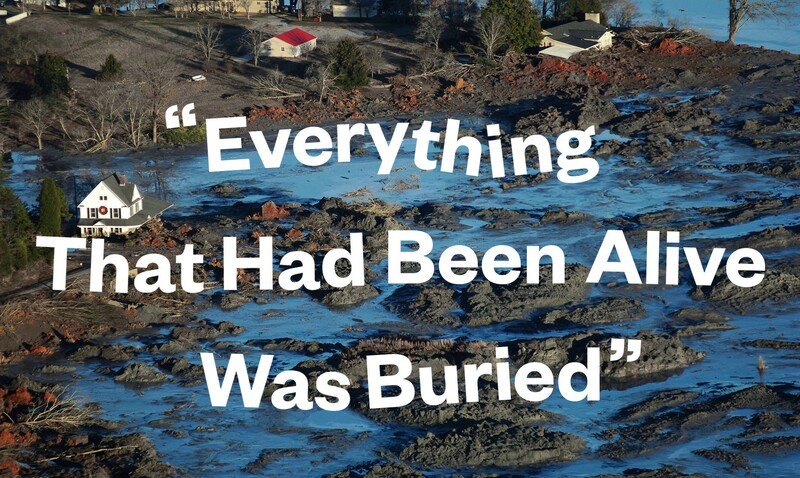 Kingston, though, is by far the worst coal ash disaster that the industry has ever seen: 5.4 million cubic yards of coal ash, containing at least 10 known toxins, were spilled. In fact, the event that woke Sarah McCoin that night — the deluge that moved houses and ripped trees from the ground — was even bigger than the Deepwater Horizon oil spill in April 2010, which spewed approximately 1 million cubic yards of oil into the Gulf of Mexico. In January 2009, just weeks after the disaster, Kingston residents sat in the front row at a Congressional hearing on coal ash in Washington. Democratic Senator Barbara Boxer, from California, held up photos of children walking through the sludge where lawns should have been. Another photo showed coal ash debris that had been deposited on a family’s front porch. Boxer passed around a Mason jar filled with sludge that the residents had brought with them, illustrating the concerns they now had about their health and the safety of their air and drinking water. The public outcry for stronger federal regulation was loud, clear, and continuous. Congress held more hearings in the following months, and McCoin was among the locals who traveled to meet legislators. In late March at a House committee hearing, she testified about the hazards of coal ash and how badly new regulations were needed. Still, the EPA seemed committed to pushing out new regulations. In March 2009, the agency released a statement that they were “moving forward quickly to develop regulations to address the management of coal combustion residuals.” The organization said it would have proposed new rules ready for public comment by the end of the year. But the research on new rules warranted inspections of coal ash ponds around the country — and that immediately brought up a major problem: The agency didn’t know where the coal ash sites were, nor did they know when new ones were created. “The absurdity is that because neither the states nor EPA regulates coal ash impoundments, they simply don’t have information about their existence,” says Lisa Evans, an attorney with San Francisco nonprofit Earthjustice. The group has independently estimated that there are 437 coal ash landfills and 1,070 wet-storage sites across 41 U.S. states. The EPA missed its self-imposed deadline for new rules at the end of 2009. In May 2010, the agency finally released two proposed rules for discussion — one that would classify coal ash as hazardous waste, and another that would continue to call it non-hazardous. 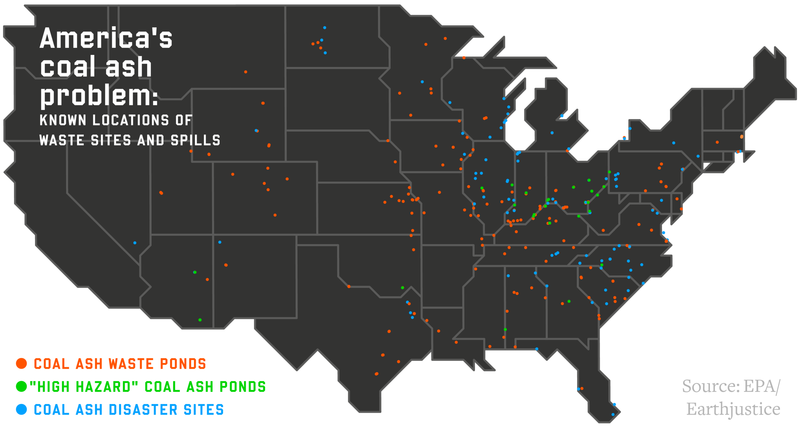 The EPA has identified at least 1,507 coal ash waste sites across the United States — dry landfills and man-made ponds. At least 535 ponds operate without protection to prevent hazardous chemicals from leaching into the ground. There have been 208 known contamination and spills, with the TVA spill being the worst. Regulating coal ash under hazardous-waste laws would allow for federal regulation and federal and state enforcement, and would involve official monitoring of corrective actions. The non-hazardous option leaves regulation entirely to the states and invites enforcement through civil suits; any corrective actions would be self-monitoring. Making coal ash a hazardous substance would also prohibit the construction of new ponds and force existing ones to be phased out. The non-hazardous option would do neither. 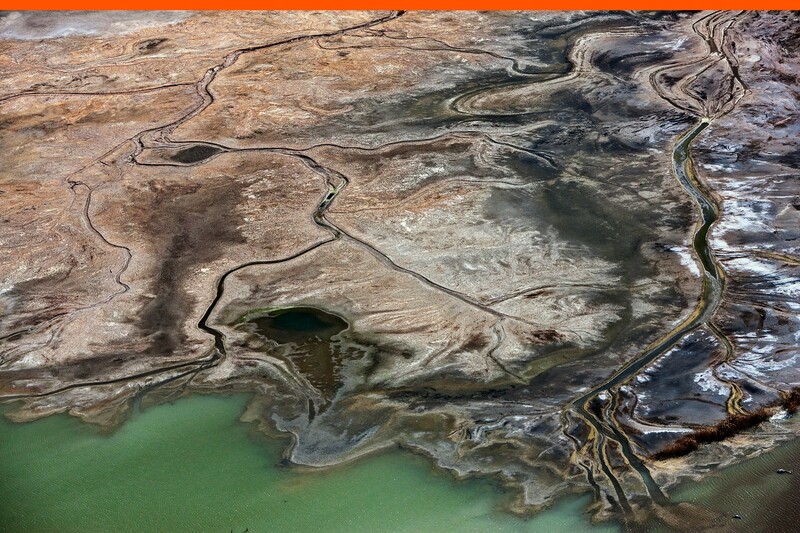 Without ponds, coal plants would be forced to store their waste in dry landfills, which can be more expensive to operate but are better at preventing leaching and spills. Environmental groups immediately began to question why the EPA would propose a rule so weak. Environment-focused news service Greenwire soon reported that the Office of Management and Budget, the White House department that oversees budget preparations for federal agencies, had demanded that the EPA include the second, weaker alternative. It is not clear what led the OMB to make this demand, and the office would not grant an interview to clarify its role. However, officials from the department met with energy industry groups approximately 30 times during its period of deliberation. The EPA, for its part, offered no explanation for the non-hazardous proposal, other than to say that both options merited consideration. (The EPA denied requests for interviews on the proposed regulations.) What’s clear is that as a result of OMB’s comments, the EPA weakened its own argument for ruling that coal ash is hazardous waste, changing language, for example, from “the need” for federal oversight to simply suggesting “the value” such oversight would hold. Industry groups like the Utility Solid Waste Activities Group (USWAG) say that both options will cause electricity-price increases, which will be passed onto the consumer. USWAG claims that the hazardous waste rule would cost between $78 billion and $110 billion over 20 years. Instead of either of the EPA’s options, however, USWAG executive director Jim Roewer says his group supports a different option — a House bill introduced last summer that leaves regulation to the states and may prevent the EPA from regulating coal ash in the future. The bill passed the House and is pending in the Senate. The coal industry further argues that labeling coal ash as hazardous would stigmatize it, and as a result, reduce coal ash recycling rates by scaring recyclers off. Roewer says recycling rates have, in fact, already dropped as a result of the mere possibility of the hazardous waste designation, although he admits the recession also contributed to the decline. Environmental groups argue the opposite: Since coal ash disposal would become more costly, they say, power plants would have more incentive to find ways to recycle it. Back in Kingston, the TVA’s independent inspector general released a damning report examining the cause of the spill. It showed that the TVA had ignored red flags, and might have prevented the spill if it had implemented recommended corrective measures. The report also called into question the TVA’s main explanation for the spill: that the storage site was constructed on a slippery foundation. The Emory River reopened for recreation in May 2010, 17 months after the initial spill, but five years later the Kingston cleanup is still ongoing — far beyond the “weeks” predicted by TVA boss Tom Kilgore, who retired in 2012. For months, train cars lined up to be loaded with sludge dredged from the river. The sludge was then carted down to Uniontown, Alabama, a mostly poor, mostly black county, where an enterprising commissioner decided that taking the waste was an economic opportunity. The county ended up taking about 4 million tons of it and dumped it in a landfill — for the price of just $4 million. It is not unusual that a place like Uniontown ended up with the Kingston waste: Coal ash is almost always dumped in communities that don’t have the political or financial muscle to reject becoming other communities’ trashcans. According to a 2012 report, of the nearly six million Americans who live within three miles of a coal-fired power plant, 39 percent are minority, and the average per capita income is $18,400. The TVA has also purchased 180 properties around Kingston — in exchange for the residents’ promise to never to sue the company again, and an agreement that they never speak publicly about what happened. On a tour around the Kingston plant in October, TVA representatives touted their new storage site for ash, which will be lined with plastic. At the old site, signs of the destruction remain. The pile of ash that sits outside the plant is, the TVA says, scheduled to close by 2016 — but there is no end date on its permit from the state and, as it’s neatly compacted and covered with grass, it doesn’t look temporary. The TVA is also converting much of the spill site into public recreation areas, with spaces for sports and bird watching. In many parts, lush green grass grows where sludge had been. Looking around, you’d never guess that a thick gray river of toxic coal ash once covered every inch of these 300 acres. But if the Kingston disaster was supposed to serve as a lesson for the industry and regulators, there is very little to show for it. In 2010, the TVA was fined just $11.5 million —the total cost of the cleanup has been estimated by some at $1.2 billion so far, and federal charges have been threatened. But the EPA has made almost no movement on regulating coal ash since its two proposals were released for public comment four years ago. Environmental groups successfully sued the agency in October 2013, resulting in a mandate from a federal judge requiring it to finally make a decision; in January 2014, it committed to releasing the final rules by the end of the year. The EPA retains the right, however, to institute no regulation: “A final action does not necessarily mean that there will be a regulation,” an agency spokesperson said in an email. States, similarly, have made little progress. In fact, only two have made any type of significant change: North Carolina classified coal ash dams as potential hazards that require inspection by state engineers, while Alabama now requires that dry landfills are lined. Lawmakers in Tennessee itself have done nothing. Kingston residents remain upset that laws that could guard against future disasters have not been enacted. No one, they say, has learned from the spill. In February 2014, a stormwater pipe underneath a coal ash pond at a power plant in North Carolina broke, leaking up to 39,000 tons of coal ash and 27 million gallons of contaminated water into a nearby river. Within days, state agencies found that arsenic levels in the water had risen well above acceptable levels. Soon after, they found a second broken pipe, then a third. It was small compared to the TVA spill — orders of magnitude smaller — but the reach was extensive. Ash was washed downstream as far as 70 miles, and warnings not to eat fish and shellfish from the river are still in place today. Over the following year, authorities in North Carolina investigated the case and in March 2015, Duke — which is worth $50 billion — was fined $25 million by the state. Critics worry it’s not enough to change the company’s behavior, and federal authorities are pursuing separate action. Three hundred miles away, the residents of Kingston agree. 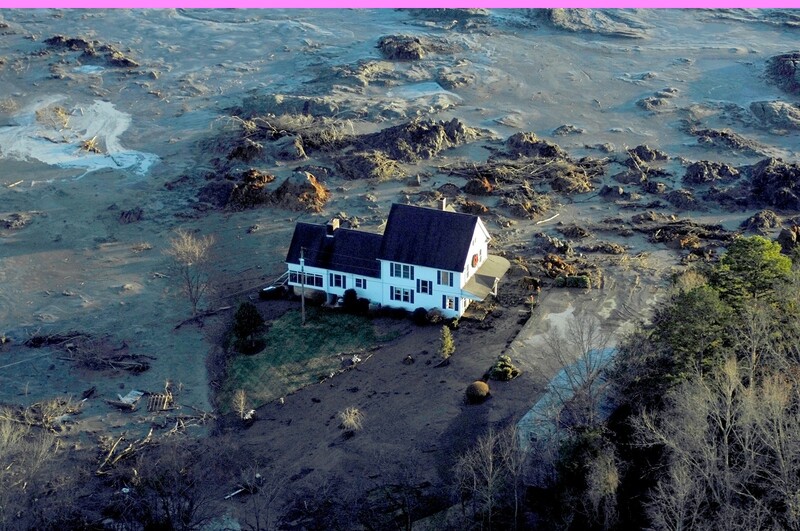 They finally won $27.8 million in a settlement five and a half years after their own disaster, but watched other accidents unfold in neighboring states and the EPA formally declare coal ash to be non-hazardous. They won some money — a pittance in comparison to the billion-dollar cleanup tab for the spill — but they’re still waiting for justice. This story was written by Rachel Cernansky, edited by Patrick Doyle, fact-checked by Ben Phelan, and copy-edited by Tim Heffernan. Art direction and infographics by Luke Shuman, photography courtesy of Dorothy Griffith and J Henry Fair. Ian Parkinson narrated the audio version. Journalist. Interested in environment, social justice & human trafficking, Africa.